Definition at line 25 of file OptXact.h. Definition at line 26 of file OptXact.cc. References AsyncJob::callEnd(), Adaptation::Icap::Xaction::closeConnection(), debugs, Adaptation::Icap::Xaction::doneWithIo(), HERE(), Adaptation::Icap::Xaction::status(), and AsyncJob::typeName. References AsyncJob::callException(), Adaptation::Icap::ServiceRep::noteFailure(), Adaptation::Icap::Xaction::service(), Adaptation::Icap::Xaction::setOutcome(), and Adaptation::Icap::xoError. Referenced by Adaptation::Icap::ModXact::callException(), and Adaptation::Icap::Xaction::detailError(). References Adaptation::Icap::Xaction::connection, Comm::Connection::fd, Adaptation::Icap::Xaction::haveConnection(), Must, NULL, Comm::ReadCancel(), and Adaptation::Icap::Xaction::reader. Referenced by Adaptation::Icap::ModXact::bypassFailure(), Adaptation::Icap::Xaction::closeConnection(), and Adaptation::Icap::Xaction::detailError(). References Adaptation::Icap::Xaction::dnsLookupDone(), Adaptation::Icap::Xaction::finalizeLogInfo(), Adaptation::Icap::Xaction::masterLogEntry(), Adaptation::Icap::Xaction::maybeLog(), Adaptation::Icap::Xaction::service(), Adaptation::Icap::Xaction::setOutcome(), and Adaptation::Icap::Xaction::tellQueryAborted(). Referenced by Adaptation::Iterator::noteInitiatorAborted(), Adaptation::Icap::Launcher::noteInitiatorAborted(), Adaptation::Icap::Xaction::noteInitiatorAborted(), Adaptation::Initiate::sendAnswer(), and Adaptation::Icap::Xaction::tellQueryAborted(). References Adaptation::Icap::Xaction::al, Adaptation::Icap::Xaction::cancelRead(), Adaptation::Icap::Xaction::closer, comm_remove_close_handler(), Adaptation::Icap::Xaction::connection, Adaptation::Icap::Xaction::connector, debugs, Adaptation::Icap::Xaction::disableRetries(), Adaptation::Icap::Xaction::doneWithIo(), Comm::Connection::fd, Adaptation::Icap::Xaction::haveConnection(), HERE(), AccessLogEntry::icap, NULL, AccessLogEntry::IcapLogEntry::outcome, Adaptation::Icap::Xaction::reader, Adaptation::Icap::Xaction::reuseConnection, Adaptation::Icap::Xaction::service(), Adaptation::Icap::Xaction::status(), Adaptation::Icap::Xaction::writer, Adaptation::Icap::xoError, and Adaptation::Icap::xoGone. Referenced by Adaptation::Icap::Xaction::callEnd(), Adaptation::Icap::Xaction::detailError(), Adaptation::Icap::Xaction::handleCommTimedout(), and Adaptation::Icap::Xaction::swanSong(). References buf, Adaptation::Icap::Xaction::callEnd(), Adaptation::Icap::Xaction::callException(), Adaptation::Icap::Xaction::cancelRead(), Adaptation::Icap::Xaction::closeConnection(), Adaptation::Icap::Xaction::dieOnConnectionFailure(), Adaptation::Icap::Xaction::doneAll(), Adaptation::Icap::Xaction::doneReading(), Adaptation::Icap::Xaction::doneWithIo(), Adaptation::Icap::Xaction::doneWriting(), Adaptation::Icap::Xaction::fillDoneStatus(), Adaptation::Icap::Xaction::fillPendingStatus(), Adaptation::Icap::Xaction::fillVirginHttpHeader(), Adaptation::Icap::Xaction::haveConnection(), Adaptation::Icap::Xaction::mayReadMore(), Adaptation::Icap::Xaction::openConnection(), Adaptation::Icap::Xaction::parseHttpMsg(), Adaptation::Icap::Xaction::scheduleRead(), Adaptation::Icap::Xaction::scheduleWrite(), Adaptation::Icap::Xaction::status(), Adaptation::Icap::Xaction::swanSong(), and Adaptation::Icap::Xaction::updateTimeout(). Referenced by Adaptation::Icap::Xaction::dieOnConnectionFailure(), Adaptation::Icap::Xaction::handleCommClosed(), Adaptation::Icap::Xaction::handleSecuredPeer(), and Adaptation::Icap::Xaction::noteInitiatorAborted(). References debugs, Adaptation::Icap::Xaction::detailError(), ERR_DETAIL_ICAP_XACT_START, HERE(), Adaptation::Icap::ServiceRep::noteConnectionFailed(), Adaptation::Icap::Xaction::service(), TexcHere, and AsyncJob::typeName. Referenced by Adaptation::Icap::Xaction::detailError(), Adaptation::Icap::Xaction::dnsLookupDone(), and Adaptation::Icap::Xaction::noteCommConnected(). References debugs, Adaptation::Icap::Xaction::isRepeatable, Adaptation::Icap::Xaction::status(), and AsyncJob::typeName. References debugs, Adaptation::Icap::Xaction::isRetriable, Adaptation::Icap::Xaction::status(), and AsyncJob::typeName. Referenced by Adaptation::Icap::Xaction::closeConnection(), Adaptation::Icap::ModXact::decideOnRetries(), Adaptation::Icap::Launcher::launchXaction(), Adaptation::Icap::Xaction::noteCommRead(), Adaptation::Icap::ModXact::noteServiceReady(), Adaptation::Icap::Xaction::openConnection(), and Adaptation::Icap::ModXact::waitForService(). References asyncCall(), Adaptation::Service::cfg(), Comm::COMM_ERROR, Adaptation::Icap::Config::connect_timeout(), Adaptation::Icap::Xaction::connection, Adaptation::Icap::Xaction::connector, Adaptation::Icap::Xaction::cs, Dns::CachedIps::current(), data, DBG_IMPORTANT, debugs, Adaptation::Icap::Xaction::dieOnConnectionFailure(), CbcPointer< Cbc >::get(), getOutgoingAddress(), HERE(), Adaptation::ServiceConfig::host, JobCallback, Adaptation::Icap::Xaction::noteCommConnected(), NULL, Comm::OK, Adaptation::ServiceConfig::port, Ip::Address::port(), Comm::Connection::remote, ScheduleCallHere, Adaptation::Icap::Xaction::service(), AsyncJob::Start(), String::termedBuf(), and Adaptation::Icap::TheConfig. Referenced by Adaptation::Icap::Xaction::clearError(), and icapLookupDnsResults(). Referenced by Adaptation::Ecap::XactionRep::blockVirgin(), AsyncJob::callEnd(), Adaptation::AccessCheck::checkCandidates(), Rock::Rebuild::checkpoint(), Downloader::downloadFinished(), Comm::TcpAcceptor::handleClosure(), handleCommRead(), Ipc::Inquirer::handleRemoteAck(), Ipc::Inquirer::inquire(), Adaptation::Icap::Launcher::noteAdaptationAnswer(), Adaptation::AccessCheck::noteAnswer(), Adaptation::Icap::Launcher::noteInitiatorAborted(), Adaptation::Icap::Launcher::noteXactAbort(), Ipc::Inquirer::requestTimedOut(), Adaptation::Iterator::step(), Adaptation::AccessCheck::usedDynamicRules(), and Adaptation::Ecap::XactionRep::useVirgin(). 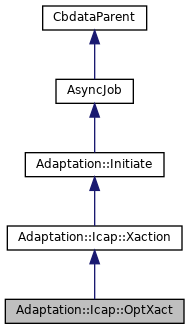 References Adaptation::Icap::Xaction::connector, AsyncJob::doneAll(), Adaptation::Icap::Xaction::reader, Adaptation::Icap::Xaction::securer, and Adaptation::Icap::Xaction::writer. Referenced by Adaptation::Icap::Xaction::detailError(), and Adaptation::Icap::ModXact::doneAll(). Definition at line 42 of file OptXact.h. References Adaptation::Icap::Xaction::commEof, finalizeLogInfo(), readAll, and swanSong(). References Adaptation::Icap::Xaction::connector, Adaptation::Icap::Xaction::doneReading(), Adaptation::Icap::Xaction::doneWriting(), Adaptation::Icap::Xaction::haveConnection(), Adaptation::Icap::Xaction::reader, and Adaptation::Icap::Xaction::writer. Referenced by Adaptation::Icap::ModXact::bypassFailure(), Adaptation::Icap::Xaction::callEnd(), Adaptation::Icap::Xaction::closeConnection(), and Adaptation::Icap::Xaction::detailError(). Referenced by Adaptation::Icap::Xaction::detailError(), and Adaptation::Icap::Xaction::doneWithIo(). References MemBuf::append(), Packable::appendf(), Adaptation::Icap::Xaction::commEof, Adaptation::Icap::Xaction::connection, Comm::Connection::fd, Adaptation::Icap::Xaction::haveConnection(), NULL, and Adaptation::Icap::Xaction::stopReason. Referenced by Adaptation::Icap::Xaction::detailError(), Adaptation::Icap::ModXact::fillDoneStatus(), and Adaptation::Icap::Xaction::status(). References MemBuf::append(), Packable::appendf(), Adaptation::Icap::Xaction::connection, Comm::Connection::fd, Adaptation::Icap::Xaction::haveConnection(), NULL, Adaptation::Icap::Xaction::reader, and Adaptation::Icap::Xaction::writer. Referenced by Adaptation::Icap::Xaction::detailError(), Adaptation::Icap::ModXact::fillPendingStatus(), and Adaptation::Icap::Xaction::status(). Definition at line 127 of file OptXact.cc. References Adaptation::Icap::Xaction::al, AccessLogEntry::IcapLogEntry::bodyBytesRead, AccessLogEntry::IcapLogEntry::bytesRead, Adaptation::Icap::Xaction::finalizeLogInfo(), Http::Message::hdr_sz, AccessLogEntry::icap, Adaptation::Icap::Xaction::icapReply, Adaptation::methodOptions, NULL, and AccessLogEntry::IcapLogEntry::reqMethod. References Adaptation::Icap::Xaction::detailError(), ERR_DETAIL_ICAP_XACT_CLOSE, and AsyncJob::mustStop(). Definition at line 40 of file OptXact.cc. References MemBuf::content(), current_time, debugs, HERE(), Adaptation::Icap::Xaction::icap_tio_start, MemBuf::init(), makeRequest(), Adaptation::Icap::Xaction::scheduleRead(), Adaptation::Icap::Xaction::scheduleWrite(), Adaptation::Icap::Xaction::status(), and MemBuf::terminate(). Definition at line 83 of file OptXact.cc. References current_time, debugs, AsyncJob::done(), Adaptation::Answer::Forward(), HttpHeader::getByNameListMember(), RefCount< C >::getRaw(), Http::Message::header, HERE(), Adaptation::Icap::Xaction::icap_tio_finish, Adaptation::Icap::Xaction::icapReply, SBuf::isEmpty(), Must, NULL, parseResponse(), readAll, Adaptation::Icap::Xaction::scheduleRead(), Adaptation::Initiate::sendAnswer(), Adaptation::Icap::Xaction::setOutcome(), and Adaptation::Icap::xoOpt. References assert, Adaptation::Icap::Xaction::closeConnection(), Adaptation::Icap::Xaction::connector, debugs, Adaptation::Icap::Xaction::haveConnection(), HERE(), NULL, Adaptation::Icap::Xaction::reuseConnection, Adaptation::Icap::Xaction::status(), TexcHere, Adaptation::Icap::Xaction::theService, and AsyncJob::typeName. Referenced by Adaptation::Icap::Xaction::noteCommConnected(), and Adaptation::Icap::Xaction::noteCommTimedout(). Definition at line 76 of file OptXact.cc. References debugs, HERE(), and Adaptation::Icap::Xaction::status(). References AsyncCall::cancel(), Comm::Connection::close(), Adaptation::Icap::Xaction::closer, comm_remove_close_handler(), Security::EncryptorAnswer::conn, debugs, Adaptation::Icap::Xaction::detailError(), ERR_DETAIL_ICAP_XACT_SSL_START, Security::EncryptorAnswer::error, Comm::Connection::fd, CbcPointer< Cbc >::get(), Adaptation::Icap::Xaction::handleCommConnected(), Comm::IsConnOpen(), Must, Adaptation::Icap::ServiceRep::noteConnectionFailed(), Adaptation::Icap::ServiceRep::noteConnectionUse(), NULL, Adaptation::Icap::Xaction::securer, Adaptation::Icap::Xaction::service(), TexcHere, and AsyncJob::typeName. References Adaptation::Icap::Xaction::connection, Comm::Connection::isOpen(), and NULL. Referenced by Adaptation::Icap::ModXact::bypassFailure(), Adaptation::Icap::Xaction::cancelRead(), Adaptation::Icap::Xaction::closeConnection(), Adaptation::Icap::Xaction::detailError(), Adaptation::Icap::Xaction::doneWithIo(), Adaptation::Icap::Xaction::fillDoneStatus(), Adaptation::Icap::Xaction::fillPendingStatus(), Adaptation::Icap::ModXact::fillPendingStatus(), Adaptation::Icap::Xaction::handleCommTimedout(), Adaptation::Icap::Xaction::openConnection(), Adaptation::Icap::Xaction::scheduleRead(), Adaptation::Icap::Xaction::scheduleWrite(), Adaptation::Icap::ModXact::startReading(), and Adaptation::Icap::Xaction::updateTimeout(). Definition at line 53 of file OptXact.cc. References Adaptation::Icap::Config::allow206_enable, MemBuf::append(), Packable::appendf(), Adaptation::Service::cfg(), MemBuf::content(), MemBuf::contentSize(), crlf, Adaptation::ServiceConfig::host, Adaptation::Icap::Xaction::icapRequest, Must, Http::Message::parse(), Adaptation::ServiceConfig::port, Adaptation::Icap::Config::reuse_connections, Adaptation::Icap::Xaction::service(), SQUIDSTRINGPH, SQUIDSTRINGPRINT, MemBuf::terminate(), Adaptation::Icap::TheConfig, and Adaptation::ServiceConfig::uri. Referenced by Adaptation::Icap::Xaction::clearError(), and Adaptation::Icap::Xaction::noteCommConnected(). References Adaptation::Icap::Xaction::doneReading(), SBuf::length(), and Adaptation::Icap::Xaction::readBuf. Referenced by Adaptation::Icap::Xaction::detailError(), Adaptation::Icap::ModXact::parseBody(), Adaptation::Icap::ModXact::parseHeaders(), and Adaptation::Icap::Xaction::parseHttpMsg(). References AsyncCall::cancel(), Adaptation::Icap::Xaction::closer, Adaptation::Icap::Xaction::handleCommClosed(), NULL, and Adaptation::Icap::Xaction::securer. Referenced by Adaptation::Icap::Xaction::noteCommConnected(), and Adaptation::Icap::Xaction::repeatable(). References asyncCall(), Adaptation::Icap::Xaction::closer, comm_add_close_handler(), commSetConnTimeout(), CommCommonCbParams::conn, Adaptation::Icap::Config::connect_timeout(), Adaptation::Icap::Xaction::connection, Adaptation::Icap::Xaction::connector, Adaptation::Icap::Xaction::cs, Adaptation::Icap::Xaction::dieOnConnectionFailure(), Comm::Connection::fd, fd_table, CommCommonCbParams::flag, Adaptation::Icap::Xaction::handleCommConnected(), Adaptation::Icap::Xaction::handleCommTimedout(), Adaptation::Icap::Xaction::handleSecuredPeer(), Adaptation::Icap::Xaction::masterLogEntry(), Must, Adaptation::Icap::Xaction::noteCommClosed(), Adaptation::Icap::Xaction::noteCommTimedout(), Adaptation::Icap::ServiceRep::noteConnectionUse(), NULL, Comm::OK, Adaptation::Icap::Xaction::securer, Adaptation::Icap::Xaction::service(), AsyncJob::Start(), Adaptation::Icap::TheConfig, Adaptation::Icap::Xaction::theService, and Comm::TIMEOUT. Referenced by Adaptation::Icap::Xaction::dnsLookupDone(), Adaptation::Icap::Xaction::openConnection(), and Adaptation::Icap::Xaction::repeatable(). References Adaptation::Icap::Xaction::al, AccessLogEntry::IcapLogEntry::bytesRead, Adaptation::Icap::Xaction::commEof, CommCommonCbParams::conn, debugs, Adaptation::Icap::Xaction::disableRetries(), Comm::ENDFILE, CommCommonCbParams::flag, Adaptation::Icap::Xaction::handleCommRead(), AccessLogEntry::icap, Comm::INPROGRESS, SBuf::isEmpty(), SBuf::length(), Must, AsyncJob::mustStop(), NULL, Comm::OK, SBuf::rawAppendStart(), Adaptation::Icap::Xaction::readBuf, Adaptation::Icap::Xaction::reader, Comm::ReadNow(), SBuf::reserveCapacity(), Adaptation::Icap::Xaction::retriable(), Adaptation::Icap::Xaction::reuseConnection, Adaptation::Icap::Xaction::scheduleRead(), Adaptation::Icap::Xaction::setOutcome(), CommIoCbParams::size, Adaptation::Icap::Xaction::updateTimeout(), CommCommonCbParams::xerrno, Adaptation::Icap::xoRace, and xstrerr(). Referenced by Adaptation::Icap::Xaction::repeatable(), and Adaptation::Icap::Xaction::scheduleRead(). Referenced by Adaptation::Icap::Xaction::noteCommConnected(), Adaptation::Icap::Xaction::repeatable(), and Adaptation::Icap::Xaction::updateTimeout(). References Adaptation::Icap::Xaction::al, AccessLogEntry::IcapLogEntry::bytesSent, debugs, CommCommonCbParams::flag, Adaptation::Icap::Xaction::handleCommWrote(), HERE(), AccessLogEntry::icap, Adaptation::Icap::Xaction::ignoreLastWrite, Must, NULL, Comm::OK, CommIoCbParams::size, Adaptation::Icap::Xaction::updateTimeout(), and Adaptation::Icap::Xaction::writer. Referenced by Adaptation::Icap::Xaction::repeatable(), and Adaptation::Icap::Xaction::scheduleWrite(). References Adaptation::Initiate::clearInitiator(), debugs, Adaptation::Icap::Xaction::detailError(), ERR_DETAIL_ICAP_INIT_GONE, HERE(), AsyncJob::mustStop(), CbcPointer< Cbc >::set(), Adaptation::Icap::Xaction::setOutcome(), Adaptation::Initiate::theInitiator, and Adaptation::Icap::xoGone. References asyncCall(), Adaptation::Service::cfg(), Adaptation::Icap::Xaction::connection, Adaptation::Icap::Xaction::connector, debugs, Adaptation::Icap::Xaction::disableRetries(), Adaptation::Icap::ServiceRep::getConnection(), Adaptation::Icap::Xaction::haveConnection(), Adaptation::ServiceConfig::host, icapLookupDnsResults(), ipcache_nbgethostbyname(), Comm::IsConnOpen(), Adaptation::Icap::Xaction::isRetriable, Must, Adaptation::Icap::Xaction::noteCommConnected(), Comm::OK, Adaptation::ServiceConfig::port, Adaptation::Icap::Config::reuse_connections, ScheduleCallHere, Adaptation::Icap::Xaction::service(), String::termedBuf(), Adaptation::Icap::TheConfig, and AsyncJob::typeName. Referenced by Adaptation::Icap::Xaction::detailError(), start(), and Adaptation::Icap::ModXact::startWriting(). References buf, SBuf::c_str(), Adaptation::Icap::Xaction::commEof, SBuf::consume(), debugs, error(), Http::Message::hdr_sz, SBuf::length(), Adaptation::Icap::Xaction::mayReadMore(), Must, Http::Message::parse(), Adaptation::Icap::Xaction::readBuf, Http::Message::reset(), and Http::scNone. Referenced by Adaptation::Icap::Xaction::detailError(), and parseResponse(). Definition at line 103 of file OptXact.cc. References DBG_DATA, debugs, RefCount< C >::getRaw(), Http::Message::header, httpHeaderHasConnDir(), Adaptation::Icap::Xaction::icapReply, SBuf::length(), Adaptation::Icap::Xaction::parseHttpMsg(), HttpReply::protoPrefix, Adaptation::Icap::Xaction::readBuf, Adaptation::Icap::Xaction::reuseConnection, and Adaptation::Icap::Xaction::status(). References Adaptation::Icap::Xaction::isRepeatable, Adaptation::Icap::Xaction::noteCommClosed(), Adaptation::Icap::Xaction::noteCommConnected(), Adaptation::Icap::Xaction::noteCommRead(), Adaptation::Icap::Xaction::noteCommTimedout(), and Adaptation::Icap::Xaction::noteCommWrote(). Referenced by Adaptation::Icap::Xaction::noteCommRead(), and Adaptation::Icap::Xaction::tellQueryAborted(). References Adaptation::Icap::Xaction::connection, Adaptation::Icap::Xaction::haveConnection(), JobCallback, SBuf::length(), Must, Adaptation::Icap::Xaction::noteCommRead(), Comm::Read(), Adaptation::Icap::Xaction::readBuf, Adaptation::Icap::Xaction::reader, and Adaptation::Icap::Xaction::updateTimeout(). Referenced by Adaptation::Icap::Xaction::detailError(), handleCommConnected(), handleCommRead(), Adaptation::Icap::Xaction::noteCommRead(), and Adaptation::Icap::ModXact::readMore(). References Adaptation::Icap::Xaction::connection, Adaptation::Icap::Xaction::haveConnection(), JobCallback, Must, Adaptation::Icap::Xaction::noteCommWrote(), Adaptation::Icap::Xaction::updateTimeout(), Comm::Write(), and Adaptation::Icap::Xaction::writer. Referenced by Adaptation::Icap::Xaction::detailError(), handleCommConnected(), Adaptation::Icap::ModXact::handleCommConnected(), and Adaptation::Icap::ModXact::writeSomeBody(). Referenced by Adaptation::Ecap::XactionRep::blockVirgin(), Adaptation::Iterator::handleAdaptationBlock(), Adaptation::Iterator::handleAdaptationError(), handleCommRead(), Adaptation::Icap::Launcher::noteAdaptationAnswer(), Adaptation::Icap::ModXact::startSending(), Adaptation::Iterator::step(), Adaptation::Initiate::tellQueryAborted(), Adaptation::Ecap::XactionRep::useAdapted(), and Adaptation::Ecap::XactionRep::useVirgin(). References Must, NULL, and Adaptation::Icap::Xaction::theService. Referenced by Adaptation::Icap::ModXact::bypassFailure(), Adaptation::Icap::Xaction::callException(), Adaptation::Icap::Xaction::clearError(), Adaptation::Icap::Xaction::closeConnection(), Adaptation::Icap::ConnWaiterDialer::ConnWaiterDialer(), Adaptation::Icap::ModXact::decideOnPreview(), Adaptation::Icap::Xaction::dieOnConnectionFailure(), Adaptation::Icap::Xaction::dnsLookupDone(), Adaptation::Icap::Xaction::finalizeLogInfo(), Adaptation::Icap::ModXact::finalizeLogInfo(), Adaptation::Icap::Xaction::handleSecuredPeer(), makeRequest(), Adaptation::Icap::ModXact::makeRequestHeaders(), Adaptation::Icap::ModXact::maybeAllocateHttpMsg(), Adaptation::Icap::Xaction::noteCommConnected(), Adaptation::Icap::ModXact::noteServiceAvailable(), Adaptation::Icap::ModXact::noteServiceReady(), Adaptation::Icap::Xaction::openConnection(), Adaptation::Icap::ModXact::parseIcapHead(), Adaptation::Icap::ModXact::shouldAllow204(), Adaptation::Icap::ModXact::shouldAllow206any(), Adaptation::Icap::ModXact::start(), Adaptation::Icap::Xaction::swanSong(), Adaptation::Icap::Xaction::updateTimeout(), Adaptation::Icap::ModXact::validate200Ok(), and Adaptation::Icap::ModXact::waitForService(). References Adaptation::Icap::Xaction::al, debugs, HERE(), AccessLogEntry::icap, AccessLogEntry::IcapLogEntry::outcome, and Adaptation::Icap::xoUnknown. Referenced by Adaptation::Icap::Xaction::callException(), Adaptation::Icap::Xaction::clearError(), handleCommRead(), Adaptation::Icap::ModXact::maybeAllocateHttpMsg(), Adaptation::Icap::Xaction::noteCommRead(), Adaptation::Icap::Xaction::noteInitiatorAborted(), Adaptation::Icap::ModXact::prepEchoing(), and Adaptation::Icap::ModXact::prepPartialBodyEchoing(). Definition at line 33 of file OptXact.cc. References MemBuf::append(), Packable::appendf(), buf, MemBuf::content(), Adaptation::Icap::Xaction::fillDoneStatus(), Adaptation::Icap::Xaction::fillPendingStatus(), MemBuf::reset(), and MemBuf::terminate(). Referenced by Adaptation::Icap::ModXact::bypassFailure(), Adaptation::Icap::Xaction::callEnd(), Adaptation::Icap::ModXact::callException(), Adaptation::Icap::ModXact::checkConsuming(), Adaptation::Icap::Xaction::closeConnection(), Adaptation::Icap::ModXact::decideWritingAfterPreview(), Adaptation::Icap::Xaction::detailError(), Adaptation::Icap::Xaction::disableRepeats(), Adaptation::Icap::Xaction::disableRetries(), Adaptation::Icap::ModXact::echoMore(), handleCommConnected(), Adaptation::Icap::ModXact::handleCommConnected(), Adaptation::Icap::Xaction::handleCommTimedout(), handleCommWrote(), Adaptation::Icap::ModXact::ModXact(), Adaptation::Icap::ModXact::parseMore(), parseResponse(), Adaptation::Icap::ModXact::stopBackup(), Adaptation::Icap::ModXact::stopParsing(), Adaptation::Icap::ModXact::stopSending(), Adaptation::Icap::ModXact::stopWriting(), Adaptation::Icap::ModXact::swanSong(), Adaptation::Icap::ModXact::waitForService(), Adaptation::Icap::ModXact::writeMore(), and Adaptation::Icap::ModXact::writePreviewBody(). Definition at line 122 of file OptXact.cc. References commSetConnTimeout(), commUnsetConnTimeout(), Adaptation::Icap::Xaction::connection, Adaptation::Icap::Xaction::haveConnection(), Adaptation::Icap::Config::io_timeout(), JobCallback, Must, Adaptation::Icap::Xaction::noteCommTimedout(), NULL, Adaptation::Icap::Xaction::reader, Adaptation::Icap::Xaction::service(), Adaptation::Icap::TheConfig, and Adaptation::Icap::Xaction::writer. Referenced by Adaptation::Icap::Xaction::detailError(), Adaptation::Icap::Xaction::noteCommRead(), Adaptation::Icap::Xaction::noteCommWrote(), Adaptation::Icap::Xaction::scheduleRead(), and Adaptation::Icap::Xaction::scheduleWrite(). Referenced by Adaptation::Icap::Xaction::closeConnection(), finalizeLogInfo(), Adaptation::Icap::Xaction::finalizeLogInfo(), Adaptation::Icap::ModXact::finalizeLogInfo(), Adaptation::Icap::Xaction::noteCommRead(), Adaptation::Icap::Xaction::noteCommWrote(), and Adaptation::Icap::Xaction::setOutcome(). Referenced by Adaptation::Icap::ModXact::finalizeLogInfo(), and Adaptation::Icap::Xaction::maybeLog(). Referenced by Adaptation::Icap::Xaction::closeConnection(), Adaptation::Icap::Xaction::handleSecuredPeer(), Adaptation::Icap::Xaction::noteCommClosed(), and Adaptation::Icap::Xaction::noteCommConnected(). Referenced by doneReading(), Adaptation::Icap::Xaction::doneReading(), Adaptation::Icap::Xaction::fillDoneStatus(), Adaptation::Icap::Xaction::noteCommRead(), Adaptation::Icap::Xaction::parseHttpMsg(), and Adaptation::Icap::ModXact::parsePart(). Referenced by Adaptation::Icap::Xaction::cancelRead(), Adaptation::Icap::Xaction::closeConnection(), Adaptation::Icap::Xaction::dnsLookupDone(), Adaptation::Icap::Xaction::fillDoneStatus(), Adaptation::Icap::Xaction::fillPendingStatus(), Adaptation::Icap::Xaction::haveConnection(), Adaptation::Icap::Xaction::noteCommConnected(), Adaptation::Icap::Xaction::openConnection(), Adaptation::Icap::Xaction::scheduleRead(), Adaptation::Icap::Xaction::scheduleWrite(), and Adaptation::Icap::Xaction::updateTimeout(). Referenced by Adaptation::Icap::Xaction::closeConnection(), Adaptation::Icap::Xaction::dnsLookupDone(), Adaptation::Icap::Xaction::doneAll(), Adaptation::Icap::Xaction::doneWithIo(), Adaptation::Icap::Xaction::handleCommTimedout(), Adaptation::Icap::Xaction::noteCommConnected(), and Adaptation::Icap::Xaction::openConnection(). Referenced by Adaptation::Icap::Xaction::finalizeLogInfo(), handleCommRead(), Adaptation::Icap::ModXact::handleCommRead(), and Adaptation::Icap::Xaction::Xaction(). Referenced by Adaptation::Icap::Xaction::finalizeLogInfo(), handleCommConnected(), Adaptation::Icap::ModXact::handleCommConnected(), and Adaptation::Icap::Xaction::Xaction(). Referenced by Adaptation::Icap::Xaction::finalizeLogInfo(), Adaptation::Icap::ModXact::start(), and Adaptation::Icap::Xaction::Xaction(). Referenced by Adaptation::Icap::ModXact::expectIcapTrailers(), finalizeLogInfo(), Adaptation::Icap::Xaction::finalizeLogInfo(), Adaptation::Icap::ModXact::gotEncapsulated(), Adaptation::Icap::ModXact::handle100Continue(), handleCommRead(), Adaptation::Icap::ModXact::ModXact(), Adaptation::Icap::ModXact::parseIcapHead(), parseResponse(), and Adaptation::Icap::Xaction::tellQueryAborted(). Referenced by Adaptation::Icap::Xaction::finalizeLogInfo(), makeRequest(), Adaptation::Icap::ModXact::makeRequestHeaders(), Adaptation::Icap::Xaction::tellQueryAborted(), Adaptation::Icap::Xaction::Xaction(), and Adaptation::Icap::Xaction::~Xaction(). Referenced by Adaptation::Icap::Xaction::noteCommWrote(), and Adaptation::Icap::ModXact::stopWriting(). Referenced by Adaptation::Icap::Xaction::disableRepeats(), Adaptation::Icap::Xaction::repeatable(), and Adaptation::Icap::ModXact::virginConsume(). Referenced by Adaptation::Icap::ModXact::bypassFailure(), Adaptation::Icap::ModXact::callException(), Adaptation::Icap::ModXact::decideOnRetries(), Adaptation::Icap::Xaction::disableRetries(), Adaptation::Icap::Xaction::openConnection(), Adaptation::Icap::Xaction::retriable(), and Adaptation::Icap::ModXact::virginConsume(). Definition at line 49 of file OptXact.h. Referenced by doneReading(), and handleCommRead(). Referenced by Adaptation::Icap::Xaction::mayReadMore(), Adaptation::Icap::Xaction::noteCommRead(), Adaptation::Icap::ModXact::parseBody(), Adaptation::Icap::Xaction::parseHttpMsg(), Adaptation::Icap::ModXact::parseMore(), Adaptation::Icap::ModXact::parsePart(), parseResponse(), Adaptation::Icap::ModXact::readMore(), Adaptation::Icap::Xaction::scheduleRead(), Adaptation::Icap::ModXact::stopParsing(), and Adaptation::Icap::Xaction::swanSong(). Referenced by Adaptation::Icap::Xaction::cancelRead(), Adaptation::Icap::Xaction::closeConnection(), Adaptation::Icap::Xaction::doneAll(), Adaptation::Icap::Xaction::doneWithIo(), Adaptation::Icap::Xaction::fillPendingStatus(), Adaptation::Icap::Xaction::noteCommRead(), Adaptation::Icap::ModXact::readMore(), Adaptation::Icap::Xaction::scheduleRead(), Adaptation::Icap::ModXact::startReading(), and Adaptation::Icap::Xaction::updateTimeout(). Referenced by Adaptation::Icap::ModXact::bypassFailure(), Adaptation::Icap::Xaction::closeConnection(), Adaptation::Icap::Xaction::handleCommTimedout(), Adaptation::Icap::Xaction::noteCommRead(), Adaptation::Icap::ModXact::parseIcapHead(), parseResponse(), and Adaptation::Icap::ModXact::stopWriting(). Referenced by Adaptation::Initiate::clearInitiator(), Adaptation::Icap::Launcher::doneAll(), Adaptation::Initiate::initiator(), Adaptation::Icap::Xaction::noteInitiatorAborted(), Adaptation::Initiate::sendAnswer(), Adaptation::Icap::Launcher::start(), Adaptation::Initiate::swanSong(), Adaptation::Iterator::swanSong(), Adaptation::Icap::Launcher::swanSong(), Adaptation::Icap::ModXact::swanSong(), and Adaptation::Icap::Xaction::tellQueryAborted(). Referenced by Adaptation::Icap::Xaction::handleCommTimedout(), Adaptation::Icap::Xaction::noteCommConnected(), and Adaptation::Icap::Xaction::service(). Referenced by Adaptation::Icap::Xaction::closeConnection(), Adaptation::Icap::Xaction::doneAll(), Adaptation::Icap::Xaction::doneWithIo(), Adaptation::Icap::Xaction::doneWriting(), Adaptation::Icap::Xaction::fillPendingStatus(), Adaptation::Icap::Xaction::noteCommWrote(), Adaptation::Icap::Xaction::scheduleWrite(), Adaptation::Icap::ModXact::stopWriting(), Adaptation::Icap::Xaction::updateTimeout(), Adaptation::Icap::ModXact::writeMore(), and Adaptation::Icap::ModXact::writeSomeBody().